It's the one place in Chicago where you can get a giant serving of corned beef or pastrami, with some juicy political gossip on the side. 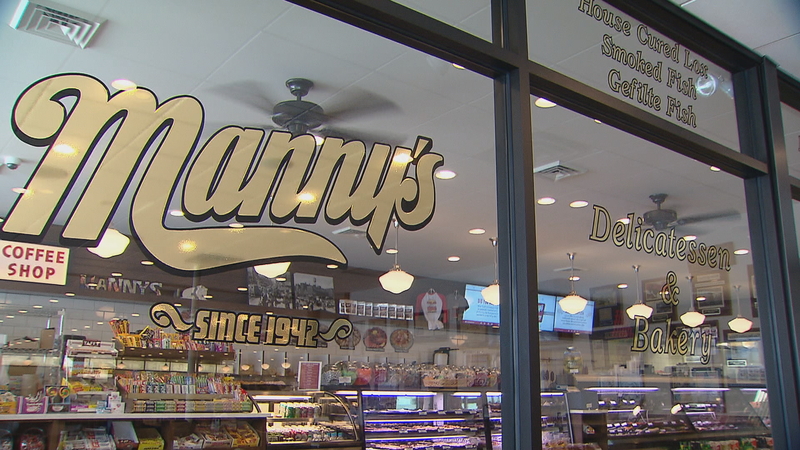 For decades, Manny's Cafeteria & Delicatessen on the Near South Side has been the go-to for a whos-who of Illinois and Chicago political power brokers. Paris Schutz: In 2008, Manny's Deli was the first public stop for newly elected President Barack Obama after his triumph in Grant Park. Four years earlier, the then-aspiring Illinois senator showed the place off to vice presidential candidate John Edwards. Over the years, Manny's has been an obligatory campaign stop, or simply a place for power brokers to craft a political sausage over a giant corned beef sandwich and cup of Matzo ball soup. Last year, Illinois Sen. Tammy Duckworth met her election foe here, former Sen. Mark Kirk for a concession lunch. Manny's owner Ken Raskin credits political guru David Axelrod with putting Manny's on the map. Ken Raskin, Manny’s owner: Once he started political advising, he was so comfortable here that he would have all his potential clients or current clients meet him at Manny's. Schutz: They eventually rewarded Axelrod with his own honorary table. This year, Manny's celebrates its 75th anniversary. In 1942, Ken Raskin's grandfather opened the family's first Jewish Deli in the Loop. In 1964, he moved the business to its current location on South Jefferson Street and named it after his son, Ken Raskin's father, Emanuel "Manny" Raskin. Ken now runs the place with his wife of 40 years Patti and says their job is to stay true to his grandfather's original vision. Ken Raskin: It's always been my job as far as I was concerned to keep it as much of a time warp as possible, so that people would come in here and feel comfortable and say my grandfather used to bring me here. Schutz: And that means the menu hasn't changed much over the decades: Giant heaping piles of fresh deli meat, liver or turkey legs, with a side of potato pancakes and a pickle. Ken Raskin: We start with the best quality we can. We cook everything the old fashioned way. We cook all our stews and soups in a big kettle sitting on top of a stove and basically everything’s from scratch. Schutz: I couldn't decide on a specific meat on my visit to Manny's, so I went with the My Four Kinder, which consists of corned beef, pastrami, turkey and brisket all in one. It certainly can be a little intimidating at first. But the key to enjoying a Manny's sandwich is to pace yourself and to remember that dinner just isn't going to happen tonight. Raskin says there have been some slight tweaks to the menu recently to change with the times. For instance, offering just a half a sandwich instead of a whole one. And, gasp, a salad bar. That's the doing of his son, prospective fourth generation Manny's owner Dan Raskin. Dan Raskin: You have to modernize and go to what your customers want, but not change the things that you're known for and what the customers come here for. Schutz: Another modern flourish is a bakery and takeout deli. But most regular customers aren't impressed by the politicians or the new fare. They just come for a good hearty cafeteria-style meal and some quality conversation. Todd Grayson, Manny’s customer: Consistent food, comfortable food, good people. The Raskins are great people. Schutz: But you can bet your latkes that the path to Illinois political stardom will continue to go through Manny's for decades to come. Manny's Deli will host a 75th anniversary party Monday, July 31 from 5:30-9 p.m. A limited number of tickets will be made available to purchase. All proceeds from the event will benefit the Illinois Restaurant Association Education Foundation. Tickets are required and capacity is limited. For more information, visit the restaurant’s website. July 24: Words of culinary wisdom from master pastry chef Jacquy Pfeiffer, co-founder of The French Pastry School. June 5: A local chamber of commerce has rebranded a Chicago neighborhood as Malt Row, where it says you’ll find the greatest concentration of microbreweries in the city. Feb. 16: A Chicago institution is closing up shop after 88 years. Visitors have been flocking to the Swedish Bakery in Andersonville to say – and eat – their goodbyes.